Ciabatta (Italian, literally "carpet slipper") is an Italian white bread made with wheat flour and yeast. The loaf is somewhat elongated, broad and flattish and, like a slipper, should be somewhat collapsed in the middle. Since the late 1990s it has been popular across Europe and in the United States, and is widely used as a sandwich bread. Ciabatta was first produced in Liguria, although at least one type of ciabatta can be found in nearly every region of Italy nowadays. 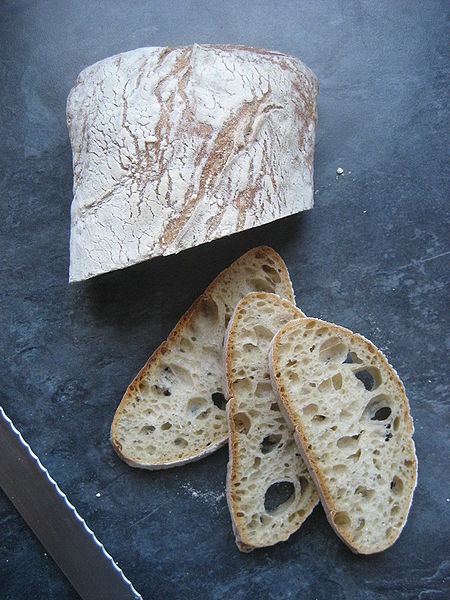 The ciabatta from the area encompassing Lake Como has a crisp crust, a somewhat soft, porous texture, and is light to the touch. The ciabatta found in Tuscany, Umbria, and Marche varies from bread that has a firm crust and dense crumb, to bread that has a crisper crust and more open texture. The more open-crumbed form, which is usual in the United States, is made from a very wet dough, often requiring machine-kneading, and a biga or sourdough starter.